I had the (last minute, very rushed and not so awesome in the throw of it all) idea to make an advent calendar for Jeff and Finn to count down the days until Christmas. I made 24 pretty little packages- one for each morning in December that we can open together. Inside are a variety of little treats- some are filled with notes with ideas or things for us to do as a family (new traditions and festive activities), some have awesome little toys or games (we have a fantastic toy store here called Livingston & Cavell and I had the BEST time picking out little treasures to share with my boys. I even found a mood ring for myself that has taken me way back to my days of crushing on Macaulay Culkin while watching 'My Girl' on repeat! Love it! ), and of course, various sweet treats (lots of Jeff's favourites!) I had so much fun planning, shopping, and wrapping each item, and now I'm excited all over again because I have already forgotten which present is happening on which day! Definitely a new Christmas tradition that we will continue for many years to come. We also had the idea to make a 12 day advent at work to count down the days until Christmas holidays. 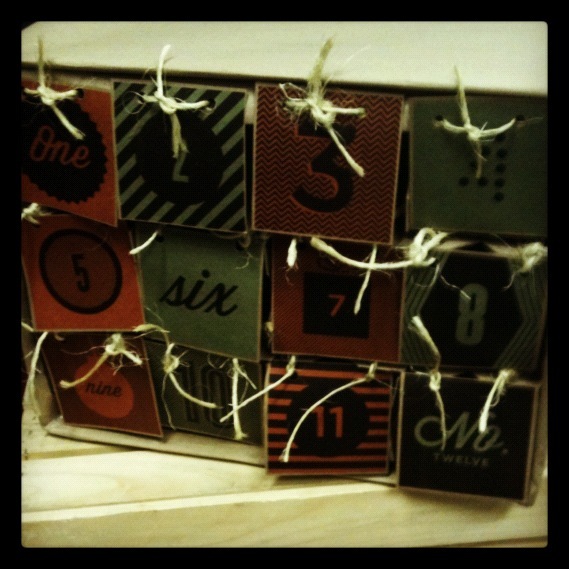 We use an old wine box covered with craft paper and a super cute downloadable advent print out from Oh Happy Day. We are planning to fill each day with homemade treats that we will all contribute to, with the last day being a bottle of wine that we can all share.